I am harmony through conflict with purity. In Atlantis, Master Serapis Bey was a great priest from the high order of purity, in the temple of the crystal light. 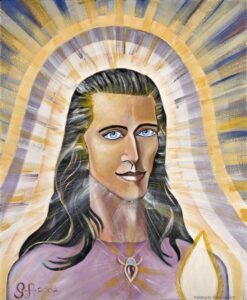 He taught divine communication and channeling of the higher vibrations from the Universe to bring through communications of other worlds with harmony and light of the purest form. Master Serapis spoke in the light language with vibration to help clear those stuck in a lower vibration status of mind, body and spirit. He would use clear quartz crystal chambers with the priest & priestesses to lift and clear with the White Flame. At the fall of Atlantis Master Serapis moved the priest & priestesses of the temple and took the large quartz crystal to Luxor in Egypt and built the Ascension Chambers to link the priest & priestesses with the Universe. Master Serapis with the white flame of purity and harmony is helping us to clear conflict in our lives, so we may speak our truth and be clear and aware of each other’s vibration. He is the Master of the Ascension and is helping the Lords of Karma to create a light field over our planet, to lift and pull the dross away with the white flame, connected with the Violet Flame to illuminate our planet and its resources. In 2013 Master Serapis placed pure white light tubes over our planet to clear energy blocks. Master Serapis working with the acturians is creating star links for our planet and the Ascension process for each person. The painting of Master Serapis shows him through multiple doorways as he links other worlds. His face is illuminated with pure white light. With his presence he helps to restore harmony. Master Serapis is gentle, very loving and clear with his intention.